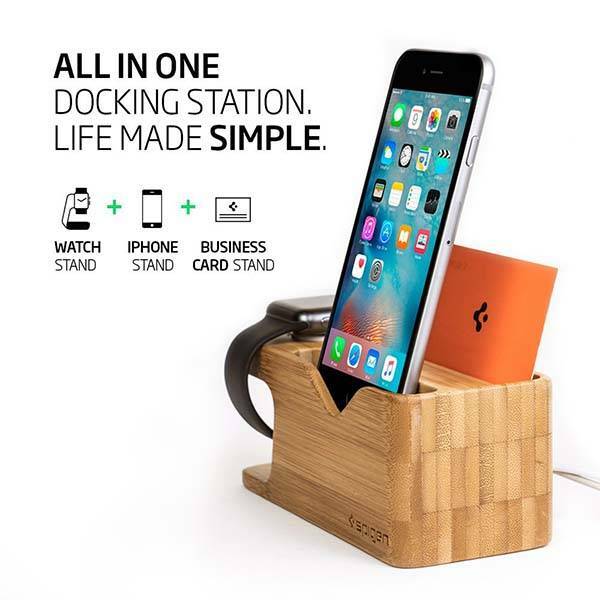 Spigen’s bamboo charging station is designed to hold your iPhone and Apple Watch for charging, and an extra card holder keeps your business cards in place. This is a practical and well-crafted docking station that measures 5.8 x 2.8 x 2.5 inches and weighs 0.3 ounces. As shown in the images, the charging dock has a simple and sleek appearance, and it’s compact enough to fit on any surface in your room. Meanwhile, the bamboo body delivers a durable construction, and the one-of-a-kind bamboo grain adds some natural arthritis that complements to your interior style. The integrated Apple Watch stand keeps Apple’s magnetic charger in place in order to charge your 38mm or 42mm Apple Watch Series 1 or Apple Watch Series 2, and a custom cradle supports all iPhone models including Apple’s latest iPhone 7/7 Plus. In addition to docking and charging Apple Watch and iPhone, the charging station also features a business card holder, and its non-slip silicone feet allows it to steadily stay on your desk or nightstand. Apart from these, built-in cable organizer keeps charging cables hidden, delivering a neat and clean desktop. 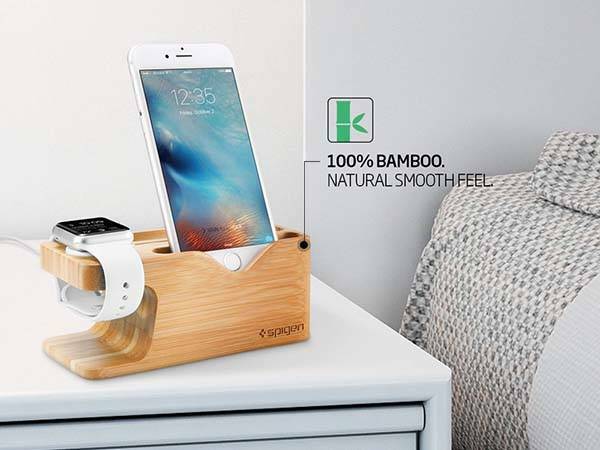 The bamboo charging station is on sale for $9.99 USD. If you’re interested, jump to Amazon for its more details. BTW, also don’t miss the Material Dock wood charging station and more related cool stuff by following tags.